Keno is relatively new to the mobile gambling scene and is racing to keep up with the progress of popular casino games such as pokies and blackjack. The game itself can be found at all leading online casinos, as well as at some licensed betting sites in Australia, with mobile keno finally starting to come to light. Advancing technology means new and exciting things for online and mobile keno are around the corner. Mobile keno is still in its infancy, however we need to give special credit to one mobile site – www.Thrills.com – which has already bit the bullet and is offering a great mobile keno title called Keno3, developed by Play’n Go. These gambling sites are constantly adding titles available in full mobile optimisation, and keno happens to be one of the final online casino games to be optimised for mobile, as the technology is still in development. As software development advances at a rapid rate, we can expect to see more mobile keno titles released in the very near future. Make sure to check out Keno3, and also have a look at the several keno games which can be played for real money at the above leading online casinos from any desktop or laptop computer, including the brilliant live dealer keno at GdayCasino.com, with secure deposits and withdrawals. Another mobile keno app that’s for free play only, Keno Tap is only available to iOS users. Although it doesn’t offer real money play, this quick and easy download is ideal for playing keno for fun on an iPhone or iPad. 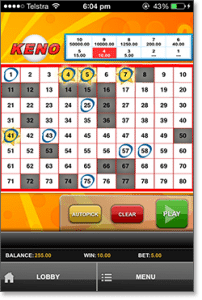 Keno Tab offers a clear, easy to use interface and navigation system, so even the least mobile savvy player will easily find their way around these mobile keno games. Tabcorp operates Keno in Queensland, NSW and Victoria in Australia. It is available to iOS and Android users, Tabcorp’s downloadable keno app reflects the Tabcorp Keno you’ll find within the walls of your local pub or RSL. Games are for recreational use only and it’s a free app, providing a great way for any new keno players to get a feel for the game before moving on to play for real money. Just like the game you find in real venues, Tabcorp mobile keno allows you to pick your bet amount, the amount of numbers to play, how many games to play these numbers in and also has the Heads and Tails side game. The app also uses Google Maps integration with a list of all the brick-and-mortar venues you can play real money keno in within your state, along with a prize guide and results section listing all recent winners. Although the social element of playing keno at the local pub is part of Aussie gambling culture, by playing mobile keno you can forget about hunting down those lost crumpled tickets, or missing the numbers being called while you’ve ducked out to the bathroom or to grab a pint. Playing mobile keno allows you to bet from anywhere your smartphone or tablet can secure an Internet connection. Mobile keno offers a fantastic alternative that can be played without having to leave the house. Mobile keno works exactly like a standard video-style game at your local pub, but without the need to hastily fill out a form with that annoying broken pencil. The typical keno format is followed, with each game consisting of 80 numbers, of which we can pick between one and 20 that hopefully come up in the draw. There are 20 numbers drawn at random for each round, and like the traditional game, the more of your numbers that hit, the bigger the theoretical cash payout. The winnings scale can differ from game to game, so check the pay scale within the mobile game in question. As Internet gambling improves by the day, more mobile keno will become available for real money bets on iPhone, Android, BlackBerry and iPads. International players can see what Australians are fussing about at Thrills.com, while Aussies can get their fix at the range of online casinos listed above or Lottoland.